Bitstop Network Services Review 2019: Is Bitstop Network Services a Good Hosting? The Filipino web hosting provider Bitstop Network Services has been in operation since 1989, making them one of the pioneers of the industry. The company provides an extensive range of hosting, internet, and even marketing services to a predominantly Philippines-based customer demographic. Bitstop Network Services is a Philippines-based web hosting provider that takes a somewhat different approach to hosting than most others in this field: they see their clients as partners. This way, they focus on those things that would help them succeed, essentially becoming a beneficiary of their success. The Bitstop Network Services website is only available in English. Weekly server backups – Bitstop Network Services has designed in their hosting platform automatic weekly backups that ensure that your website has a recent restore point in the event of a disaster. DNS registration – Bitstop Network Services takes care of their clients’ DNS registrations for free. Host your own servers – For companies that run high-volume, sophisticated websites, Bitstop Network Services offers server colocation packages. This arrangement offers clients proactive server management solutions at affordable rates. NET technology – Bitstop Network Services includes this technology in their hosting plans to help individuals and businesses build dynamic and powerful web applications with ease. Using ASP.NET server controls, you can build great web pages with less code compared to using technologies like JSP and PHP. Strangely enough, Bitstop Network Services seems to have listed all of their pages under a blog-style layout, which is not only rather difficult to read through, but also receives quite a few random comments from their users. There’s also no easy way to purchase hosting plans directly on their website: you’ll have to email them for quotations, even though they list the prices for all their packages on their website. All of this adds to the feeling that Bitstop Network Services isn’t a very well-established or credible hosting provider, even though they’ve got an official company address and contact information. Compared to leading Filipino web hosting services, Bitstop Network Services’ web hosting solutions are priced on the high end of the spectrum, especially considering the measly allocation of space and bandwidth given. For example, Linux Platinum, their most advanced shared hosting plan, only gives you 3GB of space and 12GB monthly bandwidth at about three times the rate of similar offerings from their competitors. They also charge a one-time setup fee, which is waived with most other hosting providers. Moreover, the cumbersome blog-style layout of their website and the absence of unique features in their packages undermine their credibility. The hosting vendor has no money back guarantee, no free hosting plans, and no free trial periods for any of their hosting plans. Bitstop Network Services has made available two methods of reaching their support team, namely email, phone, and live chat. The company claims that their support team is available to help their customers 24 hours a day, 7 days a week, all year round. However, my experience with the company suggests otherwise. Firstly, the Bitstop Network Services website can be quite confusing and it takes a while to even find the support links. There are over a dozen telephone numbers listed, so many users may be thoroughly confused as to which one to contact. Secondly, this not-so-typical website design can present challenges to users looking for technical documentation to help with any issues they’re facing. What’s more, I tried clicking on the live chat link provided. It seemed to be an inactive and generic live chat link that took me to the live chat software provider’s website. All in all, unless the website and corresponding services undergo a major overhaul, any user considering this web hosting provider should proceed with caution. 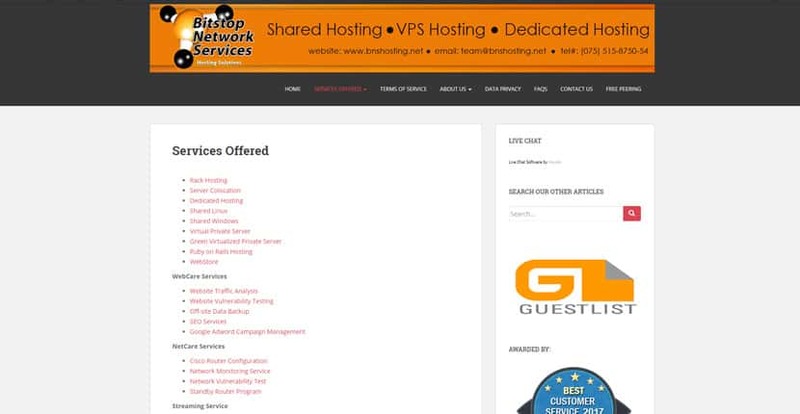 Bitstop Network Services is a web hosting solutions provider based in the Philippines. They claim to have invested considerable resources in helping individuals and businesses run and manage high-performance websites at pocket-friendly rates, but their website and customer support services suggest a disorganized and barely-credible vendor. Wondering how Bitstop Network Services stacks up against other Web Hosting companies? Enter any other Web Hosting company and we will give you a side-by-side comparison.